Have you seen box turtles yet? Box turtles are small turtles in the genus Terrapene. They have a dome-like shell that has a hinge at the bottom, allowing the turtle to close its shell completely in order to escape predators. Males are characterized by having usually red or orange eyes while females have brown eyes. River Legacy Park and the woods adjacent to River Legacy Living Science Center are home to two species of box turtles: the three-toed box turtle (Terrapene carolina triunguis) and the western ornate box turtle (Terrapene ornate ornata). The three-toed box turtle is a subspecies of the common box turtle (Terrapene carolina). As the name indicates, this turtle has three toes on its back feet. These turtles can be found walking through the forest looking for food including vegetation, small insects, mushrooms, fruits, earthworms, and snails. The males of this turtle can sometimes exhibit orange or red spots on its throat and head. Three-toed box turtles will bury themselves underneath the leaf litter during the dry season to try to conserve moisture. The other River Legacy box turtle, the western ornate box turtle, is a subspecies of the ornate box turtle (Terrapene ornata). It is characterized by ornate patterns on its shell, which are usually bright yellow. In contrast, the three-toed box turtle does not have these patterns. 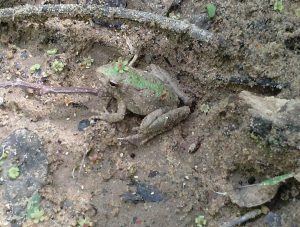 Males of this species tend to be a bit smaller than the females and also tend to have a thicker tail. Ornate box turtles tend to prefer grassland or prairie habitats rather than dense forest though they will also venture into the woods. Box turtles can live up to their 30’s, which is fairly long for a small animal. As you walk through the trails of River Legacy, keep your eyes open and you might spot a box turtle walking through the woods. 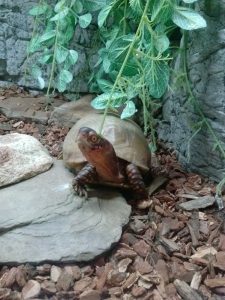 In addition, do not forget to visit River Legacy Living Science Center to see a three-toed box turtle in our exhibit hall! As you walk the trails at River Legacy, you probably have already noticed large orange-looking fruits on the ground. They are typically green in color. These fruits belong to the Osage orange tree (Maclura pomifera). 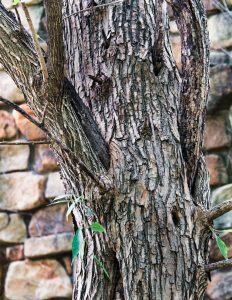 It is a relatively small tree (reaching about 30 to 50 feet tall) that is native to this area of the state. Despite its appearance and name, this plant is not related to oranges at all. In fact, it is a member of the mulberry family, the Moraceae. It is named after the Osage Native American tribe of Missouri. Nowadays, it has been spread by people to 39 states in the United States and parts of Canada but its natural range only included the Red River drainage in Oklahoma, Texas, and Arkansas. River Legacy sits right in the heart of this tree’s natural range. There is evidence that in prehistoric times, its range included a much larger area in the central part of the North American continent. In fact, some scientists have proposed that it once relied on megafauna animals that lived hundreds of thousands of years ago such as giant ground sloths (genus Megatherium) and perhaps even Columbian mammoths (Mammuthus columbi) to disperse its seeds. The large animals would eat the fruits and disperse the seeds via their droppings. Next time you take a walk at River Legacy and see Osage oranges on the ground or squirrels feeding on them, just think to what the park might have looked many hundreds of thousands of years ago with giant ground sloths and/or mammoths feasting on them. 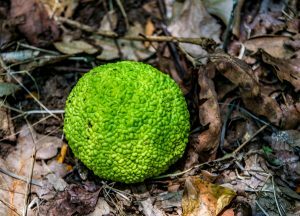 In fact, fall is a great time to come and see Osage oranges on the ground. As you walk from the parking lot to the inside of River Legacy Living Science Center, there are a couple of Osage orange trees that you can appreciate! Most species of snakes breed in the spring and summer, which is why most people see them during these two seasons. 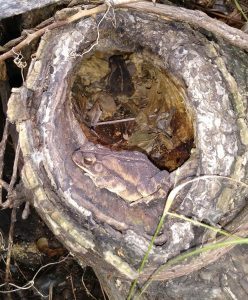 But, snakes can also be a common sight in the fall. With fall upon us, it is important to know what to do if you encounter a snake in the wild. But first, it is worth knowing why snake sightings are a common fall occurrence as well. There are a few reasons for this. One, baby snakes usually are born in the summer. Fall is the perfect time for those that survived to start looking for their first meal before winter comes. 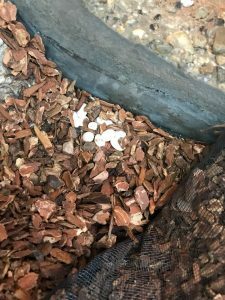 In addition, both adult and baby snakes start to search for safe places to hide where they will spend most of the winter in brumination, which is a term for the slowing down of their metabolism. Lastly, some species of snakes also breed in the fall. A couple of examples include the rough green snake (Opheodrys aestivus) and the copperhead (Agkistrodon contortrix). 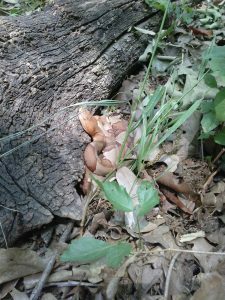 If you encounter a snake along a trail, be sure to observe from a distance. Most snakes will move quickly off the path while others might stay as still as possible. If you can, walk around the snake, giving it a wide berth. Be sure to learn more about snakes at River Legacy Living Science Center! 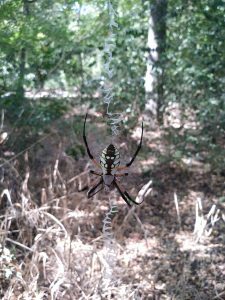 Most of our encounters with nature occur during the day, whether it’s hiking, or walking in a park and seeing plants and animals all around us. But, did you know that nature is just as active, if not more active, at night? There are several species of animals that are strictly nocturnal. In August, we talked about why certain animals have evolved nocturnal behaviors. After Dark In The Park is coming up here at River Legacy Oct. 6th-8th. So, we think this is a good time to revisit the topic of nocturnality a bit more in depth with a couple of examples. When you are out in nature at night, you may be able to spot some species of nocturnal animals. Bats (Order Chiroptera) are well adapted to night life. Some bats have evolved echolocation to find their prey, which includes flying insects such as moths and mosquitoes. Echolocation just means that bats emit sound waves and are able to detect when they bounce off their prey to determine where it is. 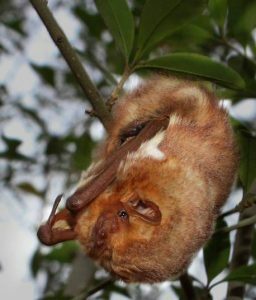 Some common species of bats in this area include the Mexican free-tailed bat (Tadarida brasiliensis), the Eastern red bat (Lasiurus borealis), and the hoary bat (Lasiurus cinereus). When you are attending After Dark In The Park with us, take a few seconds to look up, especially near light posts, and see if you can spot any bats! Other nocturnal animals that you might see or hear while being outdoors at night are owls, raccoons, and opossums. Be sure to come out to After Dark In The Park and do not miss the fun, which obviously includes experiencing the forest at night. For more information about the event, please visit www.riverlegacy.org. 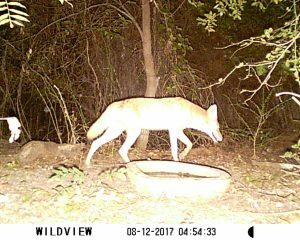 In addition to the incredible number of animals that make River Legacy their home, several equally incredible species of plants are also found in the park. 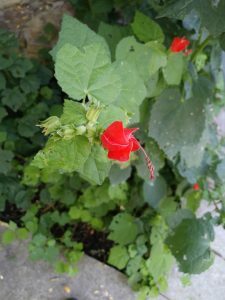 One of those plants is the Turkscap or wax mallow (Malvaviscus arboreus). 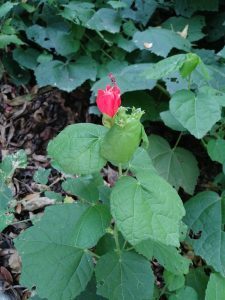 This plant is a member of the Malvaceae family, a large family that includes okra, cotton, and hibiscus, among many others. The Turkscap is native to the southeastern United States, including Texas, as well as Mexico, Central America, and South America. It is a shrub that grows to about 2-3 feet, though sometimes higher and has small red flowers that never fully open. Instead, the five petals overlap and form a small tubule, from which the stamen and pistils protrude. It flowers usually in the summer and the flowers resemble a Turkish turban, hence the name. Sometimes, hummingbirds, moths, caterpillars, spiders, butterflies, praying mantises, and other insects can be seen near or on the Turkscap! Come check out the Turkscap shrubs growing just outside the western entrance in Mike’s Room of River Legacy Living Science Center!